Jack Hollander earned his B.A. and teaching credential at the University of California, Los Angeles where he served three years as Teaching Assistant and Associate for the UCLA Bands. He has held teaching positions in the Pasadena Unified, Antelope Valley Union High and Saddleback Valley Unified School Districts. 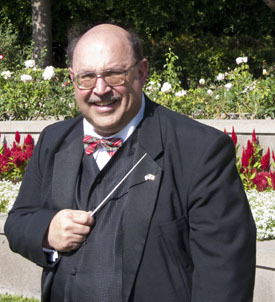 He has led Honor Bands and Orchestras in the Long Beach, Pasadena and Palm Springs schools. He has been elected by his peers to serve on the Board of Directors for the Southern California School Band and Orchestra Association (SCSBOA) for two terms, and is currently on the Executive Board for the Saddleback Valley Educators Association. Jack also serves as a clinician and adjudicator for the SCSBOA and for concert groups and parade bands.